It’s that time of year again when we reflect on the previous months, accomplishments, and challenges. Looking back over the past year there has been a whirlwind of activity. These are all spectacular and overwhelming blessings! But we still need your help. All of these accomplishments take time and money to produce. 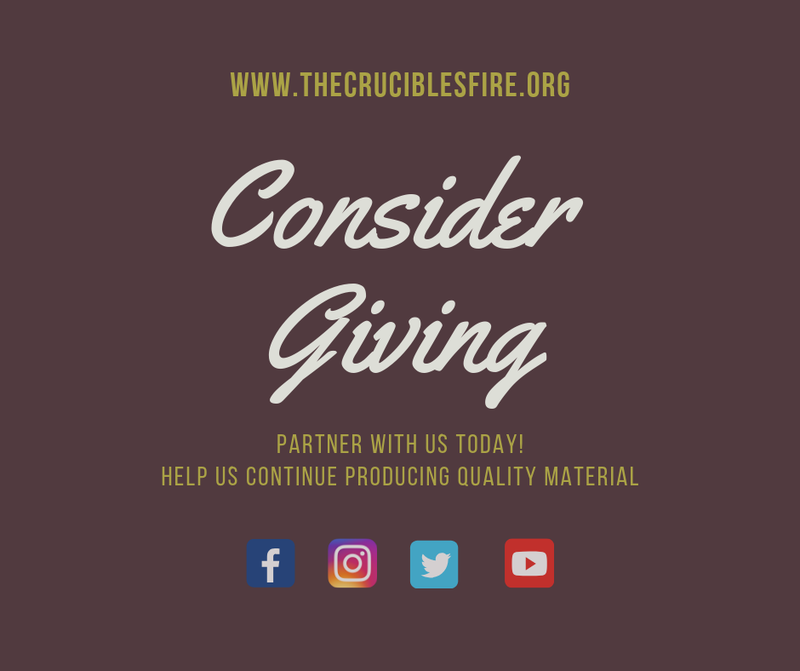 The Crucible’s Fire is a 501(c)(3) non-profit that depends completely on the generosity of people like you to keep our ministry going. We have no formal income or support at this time, but this doesn’t prevent the ongoing monthly costs of website maintenance, bank fees, administrative costs, and costs of publications from occurring. Would you consider giving a tax-deductible one time or recurring gift before December 31st? Anything would be appreciated. For any gift of 25.00 or more, you will receive a copy of The Crucible’s Fire: A Story of God’s Faithfulness. This year we hope to see even more training, teaching, and helpful publications roll off the presses to edify the body of Christ. We are almost ready to release a new eBook, How Does Sin Take Root in My Soul? And What can I do About It? You won’t want to miss this helpful look into how to defeat sin in our lives. Donate now and we’ll send you a FREE copy as soon as it releases! Again, Thank you in advance for considering partnering with us to continue producing quality material and encouragement as we help others Learn. Teach. Repeat. Follow us on Facebook, Instagram, Twitter, and YouTube to stay up-to-date on encouraging teaching and product release news. Older PostWas the Night of Jesus' Birth Really Silent?